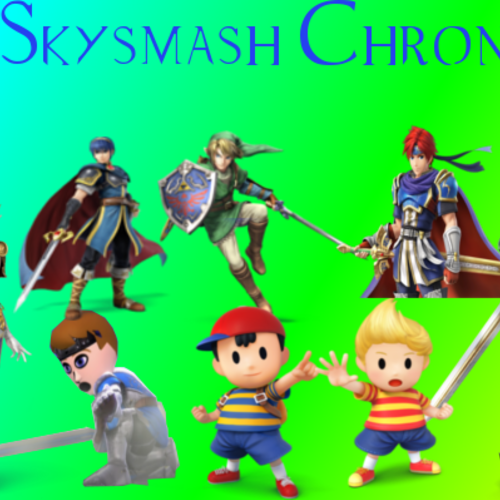 Set in the fictional world of Skysmash, The Skysmash Chronicles follows the misadventures of Link, Roy, Marth, Zelda, Prince Kykren, Lucina, Ness, and Lucas, better known as the Skysmashers, as they juggle their ordinary life and battling the forces of darkness that is Ganondorf Dragmire and Bowser, Maliceia and Koorane. I would rather not give the actors/actresses a set date I want their voices, but the website requires me to. Truth be told, I don't have a deadline. I have a lot of time on my hands. But I do want the actors/actresses to respond as soon as possible. Keep in mind I'm new to this, so I'm not 100% sure how I do some of this. I want this is to be a fun series, but I also want it to be done. No pressure. NOTE: KOORANE IS NOT LISTED HERE BECAUSE I AM THE VOICE FOR HIM. JUST LETTING YOU KNOW. Link is a noble hero who would do anything to keep him and his loved ones safe. He is considered the leader of the Skysmashers and makes sure they always prevail. His voice is that of a young teen's and is slightly deep. I don't want to make myself seem like the boss, I just want everyone safe! Don't talk back to me, Ness! If you can't follow simple orders from Roy, then you can leave! Roy is a strong willed person. He has a hidden love for both Zelda and Lucina, but doesn’t know who to ask out. He is considered the smartest of the Skysmashers, always coming up with a good game-plan for different situations. He has a rather deep voice. I think you were a bit too hard on him, Link. Marth is very arrogant when it comes to fighting. He likes to tackle any situation, no matter how dire or perilous, head on. He and Roy have a hard time getting along, but they sometimes make a great duo. He has a slightly high pitched voice. Why don't we just charge in and stab them in the face, Roy?! 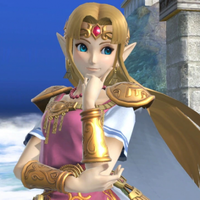 Princess Zelda is a strong-willed woman who wants the best for everyone. She is very stern when it comes to her teammates. She is especially stern and strict to Link, despite the fact she has a secret crush on him. She has a pleasant, fun to listen to voice. You can't just go about ordering people like that, Roy! Lucina is a skilled swordsman. In almost every practice duel they’ve had, she manages to beat Link and Marth. Though she is very serious, she has a heart of gold and loves nature. For her voice, do you best impersonation of Laura Bailey. Well, I'm not the only swordsman here, right? What do you mean I'm not a swordsman? 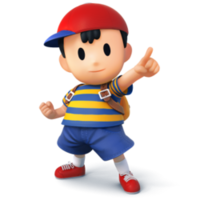 Ness is the second youngest of the Skysmashers. He is best friends with Lucas and makes a perfect team with him. Most of the time, he is very disobedient when following the game-plans made by Roy, often improvising to try and make things ‘better,’ but 99% of the time, fails at it. He has a high pitched voice. 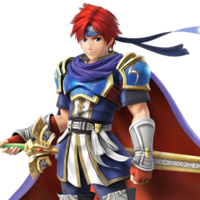 Roy, there's one more guard here! I'm gonna improvise and take it out! The main goal right now is to rescue Lucina! Lucas is the youngest of the Skysmashers and uses his magic to his advantage. 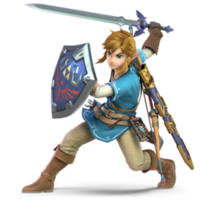 His favorite piece of magic is PK Freeze and often uses it to freeze enemies in place during dire situations. 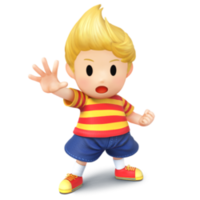 Unlike Ness, Lucas is very obedient when following Roy’s game-plans, making it hard for him to cope and get along with Ness after he improvises in one of Roy’s plans. He has a high pitched voice. Ness! Why would you do that?! Link, is Kykren at his castle? One of the two main baddies of the series. He is extremely powerful and strikes fear into his enemies. He longs for Princess Zelda to be his bride and rule the world side-by-side-by-side with Zelda and Bowser. He has a deep, intimidating voice. Fool! You have failed me for the last time! (quietly) Those Skysmashers are always getting in our way...! Darkness will engulf this world! 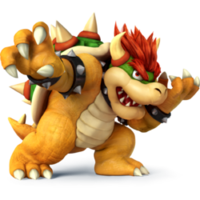 Bowser is a fierce and intimidating villain. Many of his enemies fear him for his looks, but he is really a coward at heart and uses threats to scare off his enemies to avoid a fight with him/her. He has a very raspy, deep voice. If you want to avoid death, then you'd better run like there's no tomorrow! 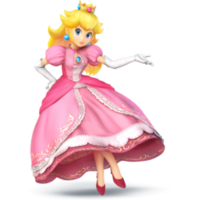 Peach is the nicest girl in Skysmash. She has a soft heart and very delicate. She often needs protecting from her boyfriend, Mario. She has a high-pitched voice. No, Mario! Don't kill him! I know he tried to kidnap me, but death isn't justice! Mario is a strong man. 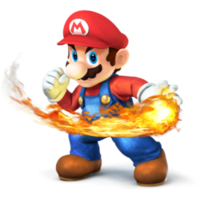 He is extremely powerful and uses his firepowers to scare off his enemies. Just do your best Charles Martinet impression. As much as I'd like to spare you, I'd like to kill you instead! Don't you DARE go near my girl again! 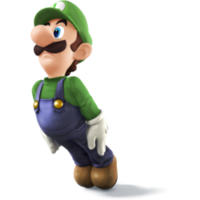 Luigi, unlike in the Super Mario Bros. series, is Mario’s rival and is often threatening to either kidnap or kill Peach. But he is very cautious when Mario is near her. He has a deep, raspy voice. Hello there, Peach. I cannot wait for you to feel pain! 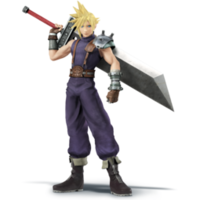 Cloud is a silent warrior who rarely ever speaks. But whenever he does speak, he tends to speak words of wisdom. He has a soft, deep voice. You don't always need brute strength to beat your enemy. You can use your mind. Trust in your heart and ask out whoever you please. What does your heart tell you? An orphan from the land below Skysmash. He raised himself by teaching himself his own sword techniques and eventually mastered swordsmanship. He is an antihero who detests the Skysmashers and thinks any enemy they should come across, they should kill. He’s attempted many times to kill villains, but has been stopped by the Skysmashers. He has a high-pitched, raspy, threatening voice. You cannot leave ANY villain alive! They do not deserve to even LIVE!!! Anette is a young princess from Skysmash’s sister kingdom, Eternal Kingdom, where the people live forever young. She is a kind girl who tries to find the good in anybody she comes across, even the villains. Her strength is that, and her weakness is that. She gains a lot of controversy from her people because she is sometimes too kind, which causes her to be the subject of kidnapping often. She has a beautiful voice, one that is soft and slightly deep. I believe that there is good in all of us. You just have to look deep for it. Maliceia is a very menacing swordsman. She is very dark hearted and has no sympathy. Her only desire is to watch the world burn. 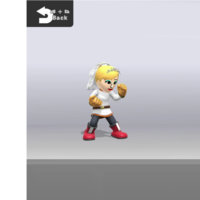 She despises the Skysmashers and Ganondorf and Bowser. She has a deep, menacing voice. Soon. This world will burn. Oh how I despise those Skysmashers! I will watch them burn before my very eyes! Those Skysmashers will not stop me this time! The sky will be painted black with smoke from the fire that will consume this world! Kykren is the prince of Skysmash. Although he is very lighthearted, he is dead serious when in battle. Use your normal voice. I'll just choose whosever voice I see fit. Link! Get me out of here! Hurry! The name says it all. I'll take any voice as long as it sounds like a suitable narrator. Years ago... the kingdom of Skysmash lived prosperously. 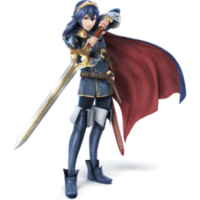 Our young hero didn't know who to choose: the brunette Princess Zelda or the blue-haired Princess Lucina. 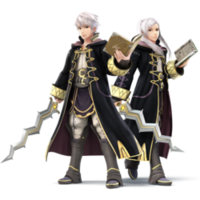 Robin works for Maliceia and Koorane. He/She is a strong sorcerer/sorceress. Since the description matches male or female, I'll accept any voice. What if I kill Li- no wait. You've tried that fifteen times. (losing his/her temper) Should we just-? No! That won't work! Lady Maliceia and Lord Koorane! I have captured Prince Kykren! 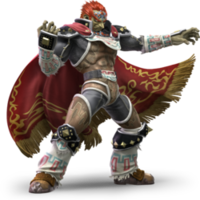 Another servant to Ganondorf Dragmire and Bowser Koopa. He is their favorite and most loyal servant. Give me any voice you see fit for the character. Get me some food... I'm peckish! 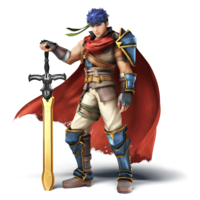 Ike is the most dangerous and promising mercenary in the entire world. Whenever he makes a promise, he makes sure he keeps it. His skill with swords makes him a force to be reckoned with. In the time since he’s been a mercenary, he has never lost a fight, and has always fulfilled his deal with the person who hires him. He has a deep, raspy, intimidating voice. His only true challenge is the Skysmashers as a team. 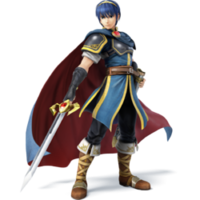 Not even Lucina, who is considered the best swordsman of the group can beat him in a one-on-one sword duel. He is a recurring character. Ganondorf. Bowser. I hear that you two have always wanted the Skysmashers gone and Zelda to be Ganondorf's bride! (evilly) For the right price, I'll make that happen! Corra is the younger sister of Corrin. She doesn’t look to the life of vigilantism, for she prefers the ordinary, relaxing life living up in Skysmash rather than down Land Kingdom. She has a rather massive crush on Cloud, who doesn’t notice the crush she has on him, for he just sees her as a friend. She must have a soft, voice. One that is pleasant to listen to. She is a recurring character. 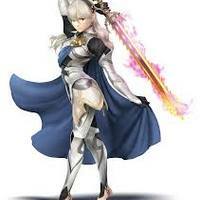 Note: This is the female skin of Corrin, thus why in my universe, she is Corrin's younger sister. (nervously) Cloud... I have something important to tell you. It's... never mind. 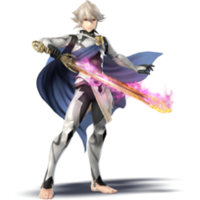 (angrily) Corrin! May the gods that watch over Skysmash have mercy on your soul! (sad) I just... wish he would recognize me, Kykren. But he doesn't.